Peter Moores says he was grateful for the chance to bid a proper farewell to Lancashire before taking charge of England for a second time. 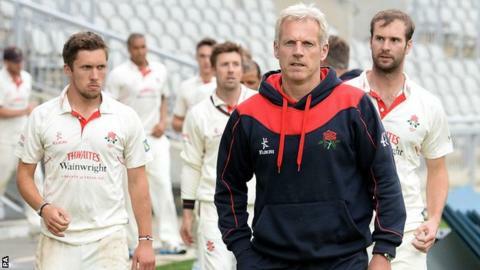 The 51-year-old's five-year reign as Lancashire coach ended with a dramatic draw against Warwickshire on Wednesday. "It's been really nice to be here for one more game at Lancashire. I owe them a lot. It's been a great partnership," he told BBC Radio Lancashire. Peter Moores returns as England head coach, five years after he was dismissed from the role following a dispute with Kevin Pietersen. Moores won eight, lost six and drew eight of his 22 Tests during his first spell, including series wins over West Indies and New Zealand (twice). Moores will now take control of the national team in all formats. The former Sussex coach succeeds Andy Flower, who resigned following England's 5-0 Ashes whitewash in Australia during the winter. Moores was initially dismissed from his position with England in January 2009 after a dispute with then-captain Kevin Pietersen, who is no longer part of the England set-up. He was appointed as Lancashire coach later that year and, in 2011, guided the Red Rose county to their first outright Championship victory for 77 years. The club were relegated a year later but sealed an immediate return to the top flight by winning the Division Two title in 2013. It has also been a transitional period off the field, with the £45m redevelopment of the county's Old Trafford home completed last summer. Moores continued: "It has been great fun. We've had some real highs and some lows, and we've been through it together as a club, not just a squad. "I feel very privileged to have been part of what has been a huge period of change for the club. In that time, we've managed to win Division One, go down and then win Division Two. "Mainly, we've developed a lot of young Lancashire players who have come through. It's exciting for the club that they hopefully will go on and have great careers and keep the club in a healthy state."